It’s March Madness! As always, we’re so excited for the annual ritual of hastily filling out brackets based on our (limited) knowledge of the teams, buying into office pools and “friendly” family competitions, keeping one eye firmly glued to the steady drip of results from the games, and ultimately losing to That Guy in Human Resources who picked winners based on the ferocity of the schools’ mascots. If you’ve waited till the last minute to fill out your bracket, or if your top-seeded Championship pick and beloved alma mater happens to go out in the first round to a 16-seed (take it from us, it ain’t pretty), then we have just the thing for you! 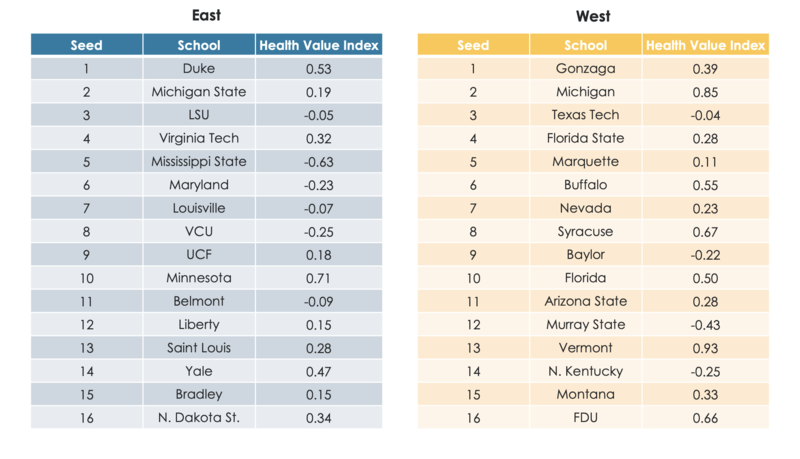 To keep the next two weeks interesting, and to make ourselves feel better for stealing time from work to watch the games, we’ve constructed our own methodology for filling out our bracket, using a metric we call the Health Value Index (HVI). Working with our friends at Ancore Health, a data consulting firm, we assigned each team a score based on the level of “healthcare value” delivered in the county where their school is located, and then compared that metric for each matchup, picking the team with a higher score to advance to the next round. Here’s how we calculated the HVI: we used county- and state-level data to assess four aspects of healthcare value important to individual consumers: access to care, cost of care, payment environment, and health of the population. (Specific metrics and data sources are listed in the chart below.) Twelve metrics across those categories were normalized and equally weighted to create county-level composite scores. 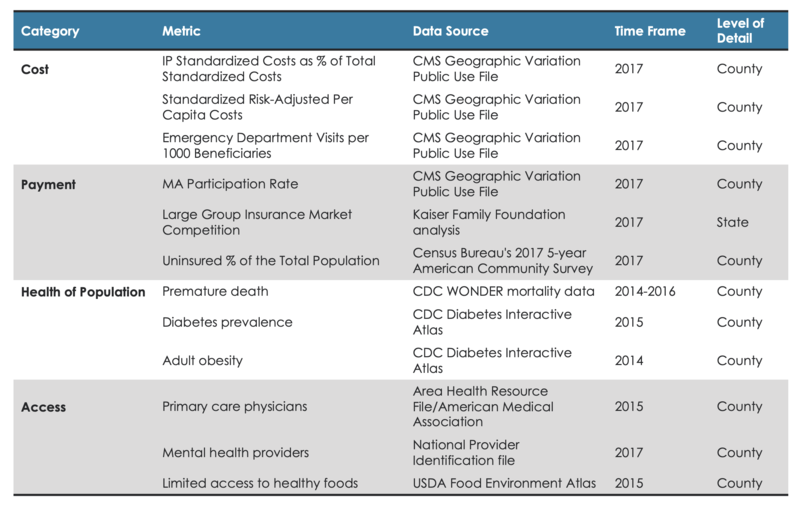 These normalized scores comprise the county’s HVI, allowing us to compare healthcare consumer value across markets. In the tables below, you can see how each of the 64 teams in this year’s NCAA tournament stacked up in terms of HVI. When we first looked at this map, it occurred to us that we might just be seeing the impact of higher income levels in the Northeast and on the West Coast. But as it turns out, income level is only moderately correlated with HVI score—wealth only accounts for some of the variability in outcomes. The top four teams according to HVI include University of North Carolina, University of Vermont, University of Wisconsin and University of Washington. Wisconsin and Washington are strong performers across the four HVI dimensions, while UNC and Vermont’s strong scores are driven by high access scores. At the other end of the spectrum we find Abilene Christian, Wofford, Gardner-Webb and Mississippi State among the bottom four teams. 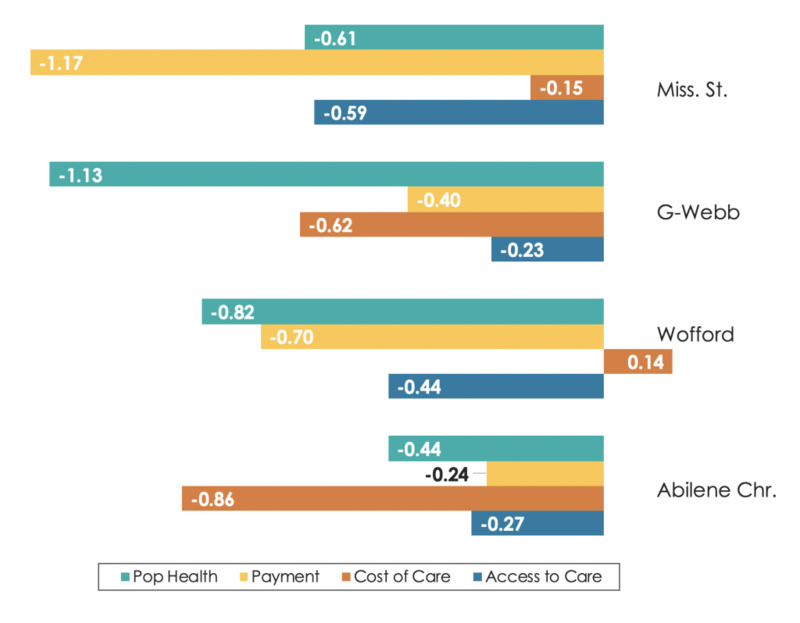 Mississippi State’s score is pulled down by a payment environment that is unfriendly to consumers (low commercial insurance competition and Medicare Advantage participation), but Oktibbeha County’s relatively low cost of care saves them from being even further behind. Gardner-Webb, located in Cleveland County, NC, just west of Charlotte, is weighed down by poor performance on all three health outcomes measures. Abilene Christian’s market, Taylor County in West Texas, is weighed down by a high cost of care and high per-capita rate of emergency department visits. Located in Spartanburg County, SC, Wofford’s performance is brought down by poor health outcomes and a non-competitive insurance market. Using our HVI methodology, let’s take a look at how we’ve filled out our bracket for this year’s tournament. The scores in parentheses next to the school’s name in each round show the margin of victory that earned the school a win in the previous round. (So, for example, Virginia walloped Gardner-Webb in its opener by having an HVI that was 1.35 higher than its opponent.) While there are some big first- and second-round upsets thanks to the variability in scores, and one very surprising debutant in this year’s Championship Game, we’re picking the top-seeded North Carolina Tar Heels to be national champions this year—thanks to the bracket-leading level of healthcare value delivered in Orange County, NC, where UNC is located. Surprised? We were. Only two of our top four HVI teams—North Carolina and Vermont—made it to the Final Four in our bracket, as it turned out that the South and Midwest regions were particularly stacked with high-ranking teams. Washington got rolled over in the second round by an unbeatable Tar Heel squad, despite the outstanding level of healthcare value in King County, WA. Wisconsin, another top-four team thanks to being based in downtown Madison, in Dane County, WI, made it all the way to the Final Four only to get edged out by UNC as well. Other top-rated teams that didn’t get nearly as far as their high HVIs would have predicted: Northeastern (Suffolk County, MA); UC Irvine (Orange County, CA) and Iona (Westchester County, NY). None of those schools could match the dominance of North Carolina. Meanwhile, on the other side of the bracket, Vermont easily bests Florida State (Leon County, FL) and Marquette University (Milwaukee County, WI), and barely edges out Michigan (Washtenaw County, MI) in the Elite Eight to face powerhouse Minnesota in the Final Four. The Golden Gophers sailed through the East—easily the least competitive quadrant of our healthcare bracket—only to get crushed by the Catamounts. For those of you who also hail from outside the Green Mountain State and might not know this, Vermont’s mascot is a large cougar-like cat. Scary! In the Championship Game, Vermont falls to UNC. 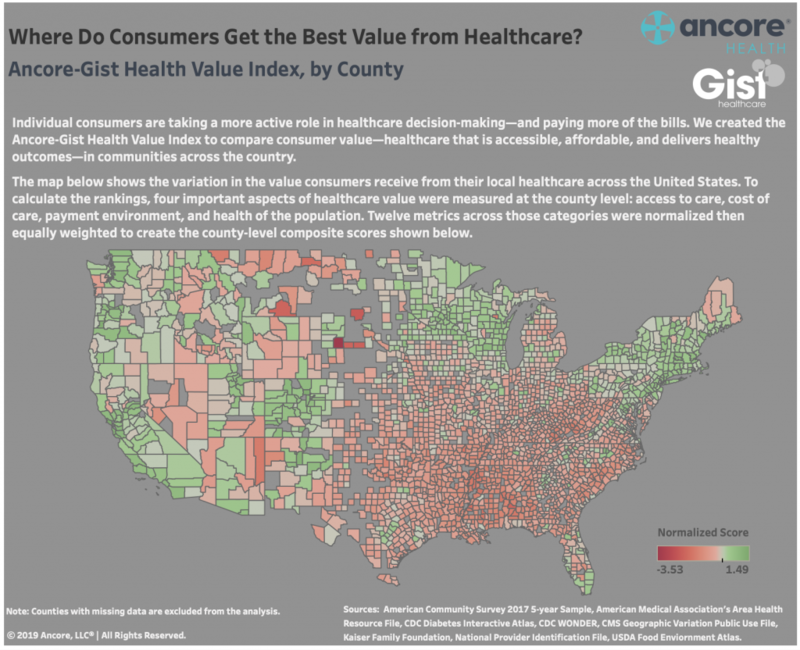 What gives the home county of UNC, Orange County, the edge in terms of healthcare value? While both lead the bracket in access to care, UNC brings higher access to primary care and mental health providers. 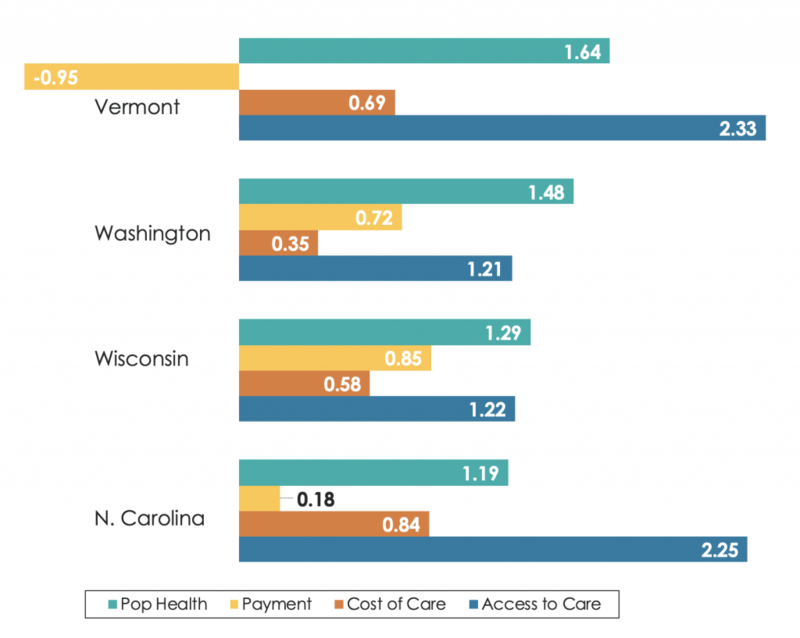 And Vermont suffers from lower payer competition and Medicare Advantage participation. Of course, we wouldn’t actually advise picking 13-seed Vermont to play in the Final—in fact, the lowest-seeded teams ever to make it to the Final Four were all 11-seeds: LSU (1986); George Mason (2006); VCU (2011); and Loyola-Chicago (2018). But given how many people are likely to pick Duke to go all the way this year, with their incredible freshmen leading the way, you could do worse than to follow our methodology, and base your picks on healthcare value. Better still might be picking your next home based on that metric! 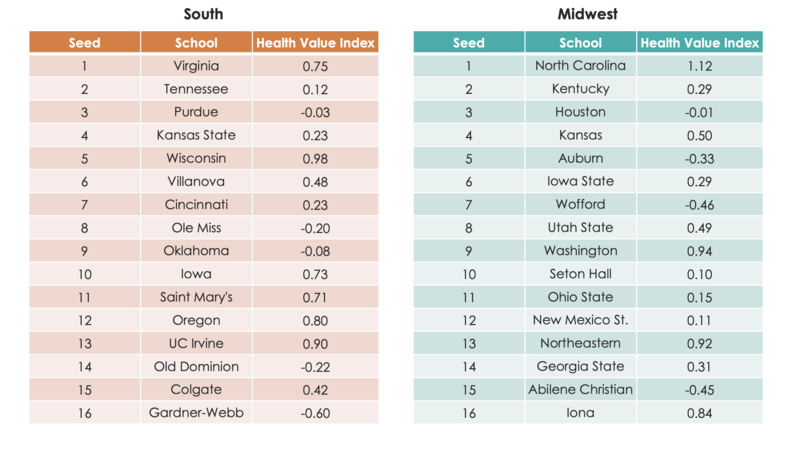 We’ll return next week with a deeper look at the healthcare value statistics for the teams that make the (real) Sweet Sixteen, and then when Final Four time comes we’ll profile each of the markets involved to give some sense of what really drives healthcare value at a local level. Until then…enjoy the games!